Steve is an amateur entomologist specializing in beetles. His friend, Dr. Sam Wells, is a professional entomologist who works at the Western Field Technology Station of Bayer Crop Science in Fresno, California. His specialty is click beetles. Since one of my favorite insects is the salt and pepper-colored eyed elater click beetle Alaus oculatus with its two large black false eyes on its pronotum (front part of the thorax between the head and the abdomen), I was pleased to learn that I would have my own orange and red click beetle—Marcia’s click beetle—as Steve called it. Furthermore, he wrote that “the etymology is given in honor of Marcia Bonta, author and naturalist.” This followed the detailed description of the beetle in Kolepterologische Rundschau (translated as the Coleopterological Review), a German journal that includes an English translation. Needless to say, I was thrilled by the honor and reminded of my early studies of the history of Pennsylvania’s natural history. They started shortly after we moved to our mountaintop home in west central Pennsylvania four decades ago, when I began learning the names of all the creatures and plants that lived here. One of the first birds I identified was the eastern phoebe—Sayornis phoebe—because four couples nested on ledges inside our garage, old outhouse, and guesthouse and plastered on the side of the springhouse. The eastern phoebe is one of three phoebe species in North America which includes the western Say’s phoebe—Sayornis saya—doubly named for Thomas Say according to Ernest A. Choate’s The Dictionary of American Bird Names. In addition, someone named Bonaparte created the genus name Sayornis, not the Bonaparte but a nephew—Charles Lucien Jules Laurent Bonaparte—who came with his family to Philadelphia in 1822 where many naturalists resided. During his six years there he re-edited a massive book on American ornithology and thus became the so-called Father of Systematic Ornithology. Bonaparte’s gull honors him. But who was Thomas Say? Say, it turned out, is called the Father of American Entomology. Of French Protestant stock, he was born in Philadelphia in 1787. His great uncle, William Bartram, who wrote Travels Through North and South Carolina, Georgia, East and West Florida, the first American nature book, encouraged Say to collect butterflies and beetles. At that time, Philadelphia was a hotbed of naturalists who started the Academy of Natural Sciences, and when Thomas Say joined, he found to his consternation that the collection of natural curiosities only consisted of six common insects, a few shells, a dried fish and a stuffed monkey. He resolved to increase the collection. Unfortunately for natural history, Say left Philadelphia in 1825 to participate in the altruistic, socialist community at New Harmony, Indiana. There he met his wife Lucy. But rancor quickly drove the founders of the community apart, and peaceful, kindly Say had to carry on with very little help, dying there in 1834 at the age of 47. However, he left a worthy legacy in his three-volume work American Entomology or Descriptions of the Insects of North America published in 1824, 1825, and 1828. He was credited with being the first efficient and extensive describer of North American insects, especially Coleoptera (beetles). Since beetles were his specialty, I wondered how many were named for him. After several hours on the Internet studying BugGuide.net, I found 22 insect species that honor Say from two species of caddisflies to Say’s stinkbug. Of those, ten are beetles including Ampedus sayi, an orange and black click beetle that LeConte named. Son of the naturalist Major John Eatton LeConte, who raised him when his mother died shortly after his birth, he learned about beetles at his father’s knee as a toddler while the major worked on his beetle collection. He was raised in New York City but moved with his family to Philadelphia when he was 27. By then he had graduated from college, begun his travels to the West in search of insects and written several papers on ground, tiger, and long-horned beetles from the eastern United States. In 1859 he edited The Complete Writings of Thomas Say on the Entomology of North America and with his friend and pupil Dr. George H. Horn he wrote The Classification of the Coleoptera of North America in 1883, which was based on the 11,000 beetle species in LeConte’s and Horn’s collections. He was also the founder and president of the American Entomological Society. Of the 36 insect species named for him that I found, almost all were beetles. One favorite exception of mine that lives on our mountain is the striking black and white LeConte’s haploa moth Haploa lecontei. Beetle species from Alaska to Texas, New Jersey to California bear his name—clown beetles, long-horned beetles, leaf beetles and, of course, a click beetle Elater lecontei. LeConte did his fair share of naming too. The attractive hairy fungus beetle Mycetophagus melsheimeri is one of them. This brought me back to the very beginning of insect studies in North America because before Say and LeConte, there was Frederick Valentine Melsheimer, also called the Father of American Entomology. He was considered the first serious American entomologist because he made the first important insect collection and wrote the first important entomological work in the United States in 1806 entitled A Catalogue of Insects of Pennsylvania. Sixty pages long, it dealt only with 1,363 species of beetles of which about 400 are recognized today. His catalogue also included the habits, life histories and food plants of some of those insects as well as the oldest description of a beetle larva in North America. But Melsheimer was primarily a minister. Born in Germany in 1849, he was ordained a chaplain in a regiment of Hessian Dragoons. Shortly after he preached his first sermon, the Dragoons were sent to North America to fight for the British in the American Revolution. After landing in Quebec in 1776, they were sent south, captured at the Battle of Bennington, and imprisoned first in Massachusetts and then in New York. Finally, Melsheimer was sent in 1779 to Bethlehem, where he resigned his commission as chaplain, assumed several Lutheran congregations in Lancaster County and married a Bethlehem native. Over the decades he served in Manheim, New Holland, Lancaster, and Hanover. In addition, he founded German-American schools and was a professor of German, Latin and Greek and one of the founders and the second president of Franklin College (now Franklin and Marshall College) in 1787. Of his eleven children, two sons followed his entomological interests. Johann Friedrich Melsheimer was an active insect collector, but he died and his brother, Dr. Franz Ernst Melsheimer, took over the collection and library. In 1842 he was elected the first president of the Entomological Society of Pennsylvania. From 1846 to 1848 he contributed seven papers on beetles to the Proceedings of the Academy of Natural Sciences and in 1853 he was elected president of the American Entomological Society. That same year the Smithsonian Institution published his Catalogue of the Described Coleoptera of the United States, which had been revised by Samuel Stehman Haldeman, still another early Pennsylvania entomologist who lived near Harrisburg, and LeConte. Altogether, his insect collection consisted of 14,000 specimens of 5,000 species. I could not find nearly as many insects named for any of the Melsheimers. In fact, only five insects—one moth Cicinnus melsheimeri called Melsheimer’s sack-bearer moth–and four beetles. One, an antlike leaf beetle—Emelinus melsheimeri has a clear “M” on its back. And yes, one is a click beetle Zorochros melsheimeri. Perhaps that isn’t such a surprise because there are at least 9,300 known click beetle species worldwide and more to be named. And we all know the famous quote about beetles by British geneticist and evolutionary biologist J. B. S. Haldane that “God has an inordinate fondness for beetles” because there are more beetle species than any other form of insects and comprise one fifth of all living species on earth. Click beetles in the family Elateridae are able to click and jump when they are on their backs by bending their heads and prothoraxes backward and then their body is suddenly straightened, producing an audible click and propelling the beetle into the air and turning it right side up again. Their larvae are wireworms, a few of which are injurious to the roots of crops. The eyed elater click beetles, which I am most acquainted with, are found in the northeast and southeast United States and Ontario. The Semiotus genus occurs principally in tropical America from Mexico to Chile. Dr. Wells began studying click beetles while in pursuit of his doctorate and says that despite their abundance little is known about them and much more taxonomic work needs to be done. He received the specimen he named for me from a colleague, Sergio Riese, in Italy, and it resides in the Bonta/Sam Wells personal insect collection in Fresno, California. 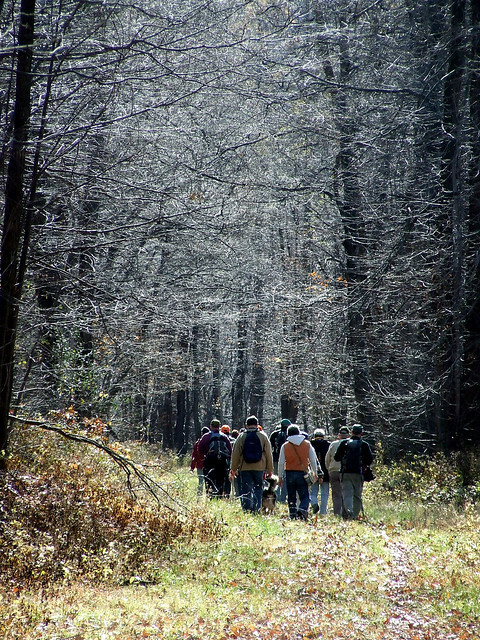 On the last day of October, twenty friends and members of the Juniata Valley Audubon Society hiked down the Allegheny Front beginning in State Gamelands 158, following the remains of the Bells Gap Narrow-Gauge Railroad. 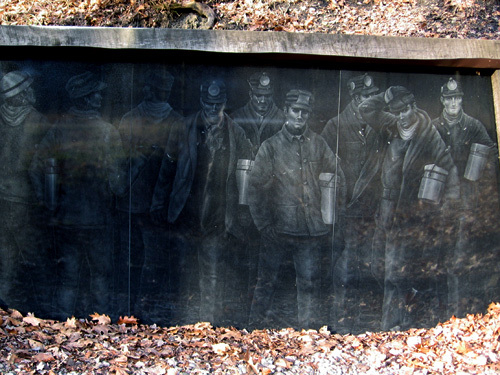 Back in 1872, it was built from the railroad station in the Logan Valley town of Bellwood to Lloydsville, nine miles uphill, to haul coal from the mines on the mountain summit down to the main line of the Pennsylvania Railroad. The cars, he wrote, were pushed up the mountain by a locomotive but descended using gravity and brakes. For a round-trip ticket, tourists paid the train company a mere 65 cents. Over the years, the forest primeval was logged and the lumber hauled down to the valley railroad. The pure, cold, living water was heavily polluted by the mining operation. Today it doesn’t cost anyone to hike, bike, or ride a horse up or down this railroad bed, now known as the Bells Gap Rail Trail. And while the forest primeval is gone, an extensive secondary forest covers the slopes as it did back in 1872. Rhododendrons still abound and so do oaks, beeches, and hemlocks along with many other tree species including mountain maple. 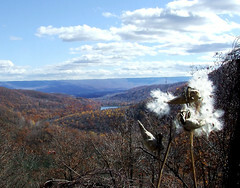 Indeed, even the view at Point Lookout, which the journalist described, hasn’t changed much — “bounded on either side by graceful mountains, clothed from base to summit with dark-green foliage, and away beyond for six miles the view is exceedingly fine, until it is shut out by Brush Mountain [the westernmost ridge in the ridge-and-valley province where I live], which rises like an immense green curtain to form the background of the picture.” With most of the leaves off the trees during our hike, the lookout also included a view of the Bellwood Reservoir, which is like a blue eye in the extensive forest. The four mile portion through the gamelands is a wide, grassy trail, and the descent is barely perceptible because the engineers who designed the railroad kept the grade at less than four percent. 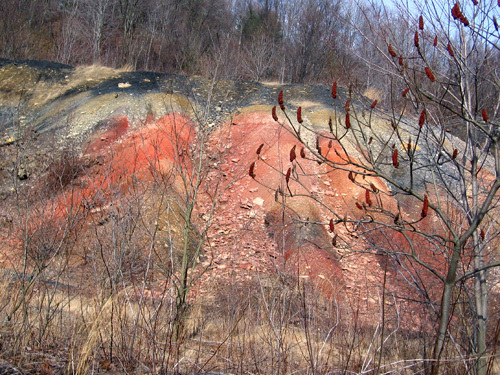 Almost immediately, on the left of the trail, we reached a series of four ponds called the Lloydsville Run Site A/B Passive Treatment System designed to neutralize acid mine drainage in Lloydsville Run, which had been affected by both strip mining and deep mining coal extraction. 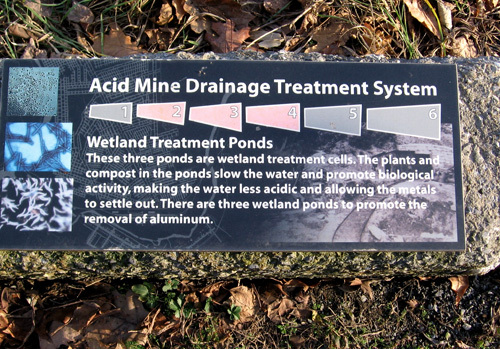 Altogether, it covers seven acres and includes an anoxic limestone drain, a limestone vertical flow pond, sediment ponds, and aerobic and anaerobic wetlands. 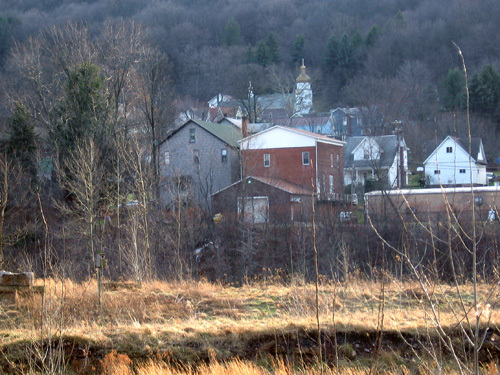 Finished in 2001 by the Pennsylvania Department of Environmental Protection, its partners in restoration included the Altoona Water Authority and the Environmental Alliance for Senior Involvement (EAST). 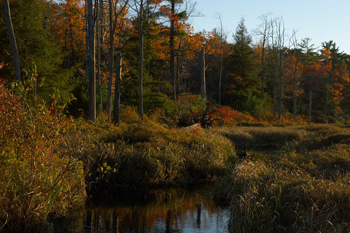 Although the EAST is now disbanded locally, many of the same volunteers continue to monitor the watershed. 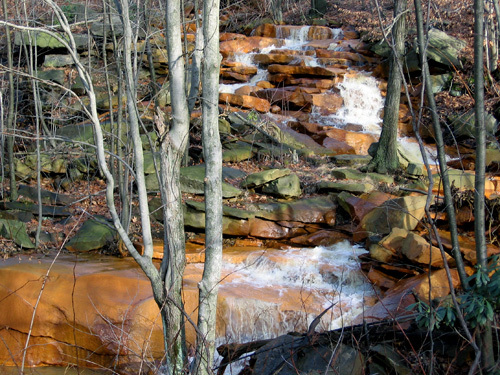 A Growing Greener grant of $337,515 and a further $166,455 from the United States Department of the Interior’s Office of Surface Mining’s Clean Streams Initiative paid for its construction. I find it ironic that industry made the mess and took the profits over a century ago and that citizens today not only had to pay to clean it up through their taxes, but volunteered to monitor it. However, the investment was worth it because in 2000 its pH level was an acidic 4.1. By 2007 it had risen to 6.92. In addition, its concentrations of heavy metals had dropped significantly. Our fellow hikers poked about at the edges of the ponds and found newts and tadpoles in them. Last spring, on a Mother’s Day hike with my husband Bruce, the wetland area was alive with singing red-winged blackbirds. Soon we reached a series of calcareous sandstone outcrops probably formed when the workers cut into the mountain to build the railroad. While the bed itself is wide, we could always peer down the steep slopes to the right at forest below. On the left, the mountain also rises, and it is there that the outcrops overhang the trail, some more dramatically than others. Blossoming witch hazel, wild hydrangea shrubs, Hercules’ club, and common nightshade covered with red berries hung from the outcrops, and we wondered what other treasures we might find there in spring. 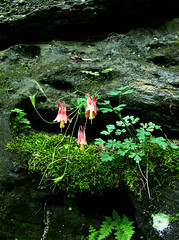 On Mother’s day columbine, early saxifrage, Canada violets and Solomon’s seal bloomed on the outcrops, and we also saw doll’s eyes or white baneberry plants. Red-berried elder shrubs grew on and next to the outcrops. Banks and banks of rhododendron often lined the trail and grew in thickets below the trail too. Large and small hemlocks looked healthy, because the hemlock woolly adelgids haven’t reached them. Clumps of paper birch signaled the colder climate atop the Allegheny Front. 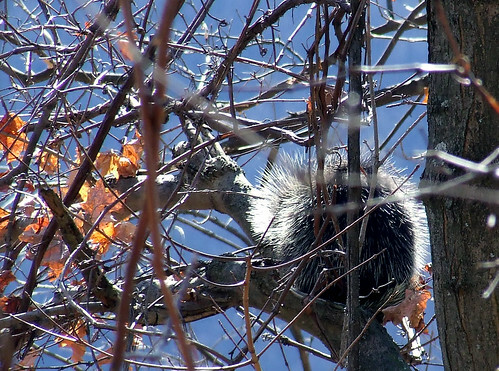 Probably the most exciting find on our October hike was a porcupine in a tree. 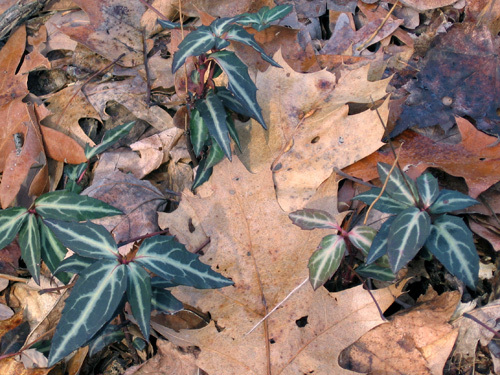 Many of the hikers had never seen one before, and it starred in several photos by the photographers in the group. After four miles in the gamelands, we crossed on to the 2.1 miles managed by volunteers of the Bells Gap Rail Trail who keep it mowed under the direction of 87-year-old Bud Amrhein. “He’s wonderful. I don’t know what we’d do without him,” Hazel Bilka told me. It was due to Bilka and a group of concerned Bellwood citizens back in the mid-1990s that the rail trail was developed. That group called itself the Bellwood Antis Community Trust and, in an effort to promote the area, surveyed the citizens in Bellwood and the surrounding township and asked them what the area needed. Overwhelmingly, the citizens wanted more recreational opportunities. After raising money for a feasibility study to develop a Bells Gap Rail Trail, they were able to persuade major landowners, including the Altoona Water Authority and township supervisors, to turn over their property along the railroad. They then received funding for the work on their 2.1 miles from the Department of Conservation and Natural Resources and the Pennsylvania Department of Transportation. On July 8, 2007 the trail, beginning at Root’s Crossing outside Bellwood was officially opened to the public, and later was connected to the gamelands. A further spur of it down into Bellwood is shared with cars and trucks. In addition to biking, hiking, and horseback riding, Bilka says that cross-country skiing and snowshoeing are popular winter activities on the trail. 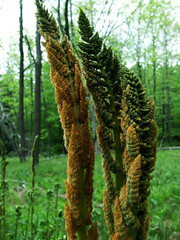 But I was eager to do a spring hike with Bruce, who hadn’t been on the October hike, and Mother’s Day was ideal. We parked at the top of the mountain in a gamelands pull-off and were immediately welcomed by singing chestnut-sided warblers, American redstarts, and ovenbirds. Eastern towhees, black-and-white warblers, dark-eyed-juncos, wood thrushes, common yellowthroats, black-throated green warblers, blue-headed vireos, scarlet tanagers, worm-eating warblers, rose-breasted grosbeaks, black-throated blue warblers and common ravens sang and called along the trail and below in the forest during our six mile hike. At 2,160 feet in elevation and 1,107 feet above Bellwood at the start of the trail, the trees, shrubs, and wildflowers were at least a week behind our mountain at 1200 feet and even further behind the fully leafed-out trees in Bellwood. 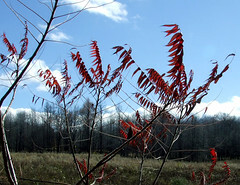 Shadbush and red-berried elder bloomed and golden catkins dangling from black birch trees lit up the forest. On the trail itself we stepped carefully to avoid beds of purple, sweet white and Canada violets as well as wild strawberry flowers. 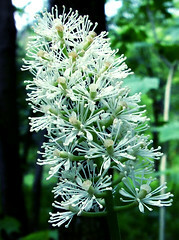 Along its edges, mayapples, columbine, and long-spurred violets blossomed, and once we found a cluster of eight blooming jack-in-the-pulpits. At the magnificent curve over Shaw Run, known as the Horseshoe Bend in the railroad days, where the train had crossed on a trestle 76 feet high, we walked down to the rushing stream and followed a deer path upstream to eat our trail lunch in a bed of foamflowers and cut-leaved toothworts beside the picturesque run. Behind us loomed the Shaw Run outcrop, a calcareous opening/cliff natural community which, according to the Blair County Natural Heritage Inventory, hosts limestone cliff specialties such as walking fern, maidenhair spleenwort, fragile fern, purple cliff brake, wild ginger, and bishop’s cap, although we did not climb it to find out. On our way back to our car, we watched common sulphurs and blue azure butterflies fluttering over the wildflowers on the trail. During our five hours there we never encountered another person. And we scarcely noticed the gentle incline. Spring, summer, autumn, winter — the Bells Gap Rail Trail is a trail for all seasons. All photos (except for the historical one) are by Dave Bonta. 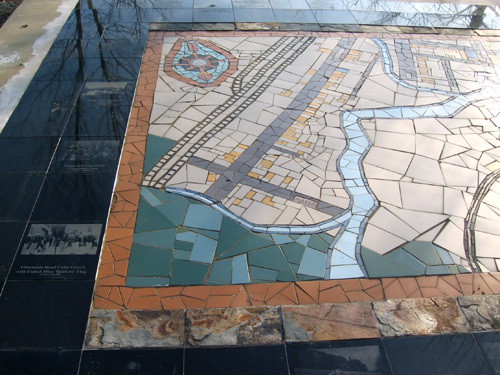 See his complete set of Bells Gap Rail Trail photos on Flickr. “It’s too darned hot,” I said on our 45th wedding anniversary. The temperature was heading into the high, humid nineties so we shelved our plan to take a hike. Instead, we followed Plan B and on a late August morning, my husband Bruce and I drove to the Ned Smith Center for Nature and Art in Millersburg, along the eastern side of the Susquehanna River. 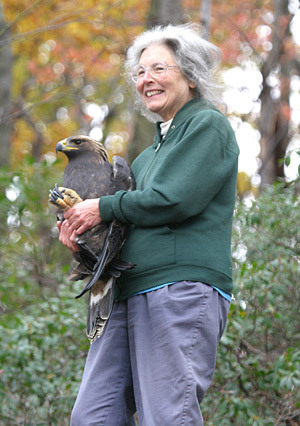 Named in honor of Millersburg resident, wildlife artist, naturalist and writer Ned Smith, the Center was founded in 1993 “to merge the arts and the natural world and foster a celebration of both,” according to their mission statement. Years ago, I had visited John James Audubon’s first home in America called “Mill Grove,” “a home,” his granddaughter Maria wrote, “He always loved and never spoke of without deep feeling.” His French father, who owned the property, sent Audubon there to escape the Napoleonic Wars. 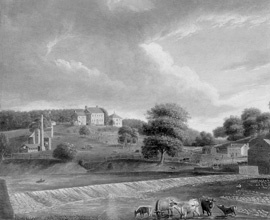 Located in eastern Pennsylvania along the Upper Perkiomen Creek in Montgomery County, it was there that Audubon began what he called his “simple and agreeable studies” of birds, learning to draw them from nature by shooting and then immediately mounting them on blocks of wood with the help of wires that held them up in lifelike positions. As part of his work, he banded the first birds in North America by tying silver threads around the legs of eastern phoebes nesting in a rock cave along the Perkiomen and was delighted when they returned the following year. He lived at Mill Grove a scant three years from 1804 until 1807, but in that time he met his future wife, a neighboring woman named Lucy Bakewell and began his lifelong love affair with the birds of North America. Because his wife’s family continued to live along the Perkiomen, Audubon often returned to Pennsylvania to visit. Built of Pennsylvania fieldstone, the farmhouse was and still is a treasure house of Audubon’s paintings. Now leased by the National Audubon Society from Montgomery County, which purchased the house and grounds back in 1951, it has been renamed the John James Audubon Center at Mill Grove. Several of Audubon’s paintings at Mill Grove were lent to the Ned Smith Center for display, including the massive oil painting “The Eagle and the Lamb,” painted in 1828 when he was in England. So too were all four volumes of his massive Birds of North America. 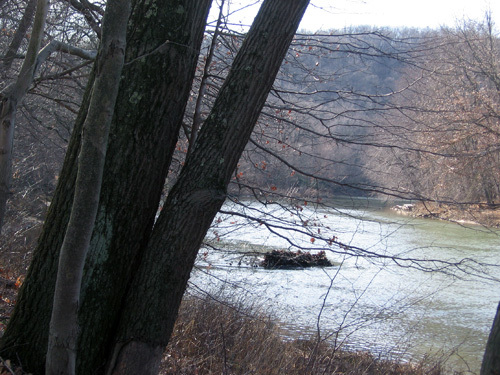 But he made his largest collecting trip in Pennsylvania in the late summer and early autumn of 1829 when he spent six weeks in what he called the “Great Pine Forest — Swamp it cannot be called” of the Upper Lehigh River “where I made many a drawing.” He lived in the home of logger Jediah Irish and his family and ate “juicy venison, excellent bear flesh and delightful trout.” However, he was distressed to see that “Trees, one after another, were… constantly heard falling during the days, and in calm nights, the greedy mills told the sad tale that in a century the noble forests around should exist no more.” Nevertheless, he painted more than 90 birds for his Birds of North America because of his trip including the red-breasted nuthatch, pileated woodpecker in a wild grape tangle, and common ravens. Near the end of his life, his focus turned to mammals and he produced, with the help of his sons and friends, The Viviparous Quadrupeds of North America. Several prints from that collection hung on the walls of the Olewine Gallery including “Pennant’s marten,” which we call the fisher. The painting portrays a live fisher that had been captured on nearby Peter’s Mountain in Dauphin County and sent to Audubon by 21-year-old Spencer Fullerton Baird, a protégé of Audubon. 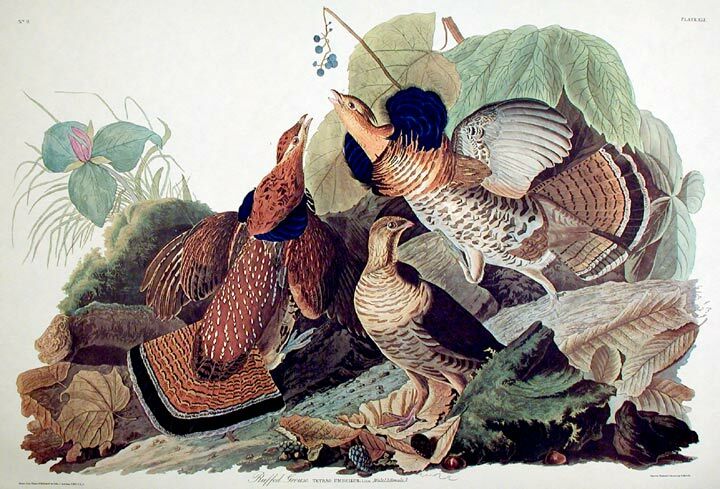 Most people have heard of John James Audubon. Fewer know of or remember Spencer Fullerton Baird. Yet he was one of several well-known Pennsylvania naturalists of the eighteenth and nineteenth centuries. Born in Reading in 1823, his widowed mother moved her seven children to Carlisle, where she had family, when Baird was ten years old. Baird and his older brother William roamed the Cumberland Valley and, in 1838, Baird began a journal in which he listed various birds and recorded the weather. The following year he corresponded with Audubon. “You see sir, I have taken (after much hesitation) the liberty of writing to you. I am but a boy, and very inexperienced, as you no doubt will observe from my description of the Flycatcher.” The flycatcher turned out to be one of two flycatchers discovered by Baird — the yellow-bellied and least flycatchers. Audubon responded enthusiastically, writing “Although you speak of yourself as being a youth, your style and the descriptions you have sent me prove to me that an old head may from time to time be found on young shoulders.” Perhaps, Audubon was reminded of the lament he wrote after his time in the Lehigh River area when he wondered why young men didn’t “occupy themselves in contemplating the rich profusion which nature has poured around them…But, alas, no! They are none of them aware of the richness of the Great Pine Swamp…” In Baird, he had found his “dear young friend” and as “a young naturalist of eminent attainments,” as Audubon described him in The Viviparous Quadrupeds of North America, Baird began collecting specimens for the book, sending Audubon a “common American wildcat” or bobcat he had shot a mile and a quarter from Carlisle that was two-and-a-half-feet long and weighed twelve-and-a-half pounds. But Baird also made his own collection of birds and mammals mostly on foot. In June 1842, he took a marathon walking trip along the Susquehanna Valley and stayed with various families along the way. He began by walking from Carlisle to Mifflin, then on to Lewistown and Stone Valley in Huntingdon County. From there he “Went over to Bear Meadows [now a state natural area in Rothrock State Forest] 9 miles off, being a meadow on top of a Mountain so Boggy that you can thrust a stick through the roots and moss 15 feet. The place is filled in most places with a dense growth of Rhododendron, Hemlock, Black Spruce, Tamarack, etc. It contains many very curious and beautiful flowers,” which is still an apt description of the place today. Continuing his walk, Baird visited the Andrew Curtins (of iron furnace fame) in Bellefonte where he saw a pair of Bewick’s wrens (now gone from Pennsylvania). 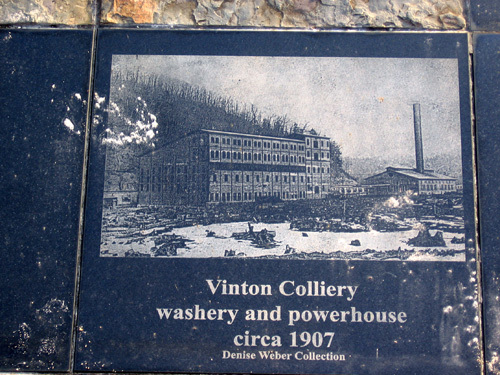 Then he walked back to the Susquehanna River where he crossed over to Northumberland to visit Joseph Priestley “whom I found very clever.” On he went to see a coal mine in Wilkes Barre and then back to Northumberland. From there he walked home in one day covering 60 miles in 15 hours. “Lost 12 pounds of flesh, and burnt to the color of old Aunt Rachel. Walked in a Blouse Check shirt, Beaverteen Pants, Heavy shoes and cap. Carried Knapsack and Gun,” he wrote to his brother William. In all he walked 2100 miles that year. A graduate of Dickinson College, he received a full professorship in natural history there in 1846. He introduced for the first time in America field excursions to his zoology and botany classes. Known affectionately as “The Prof” by his students, he continued his collecting and moved his collections from his mother’s overflowing shed to Dickinson College. 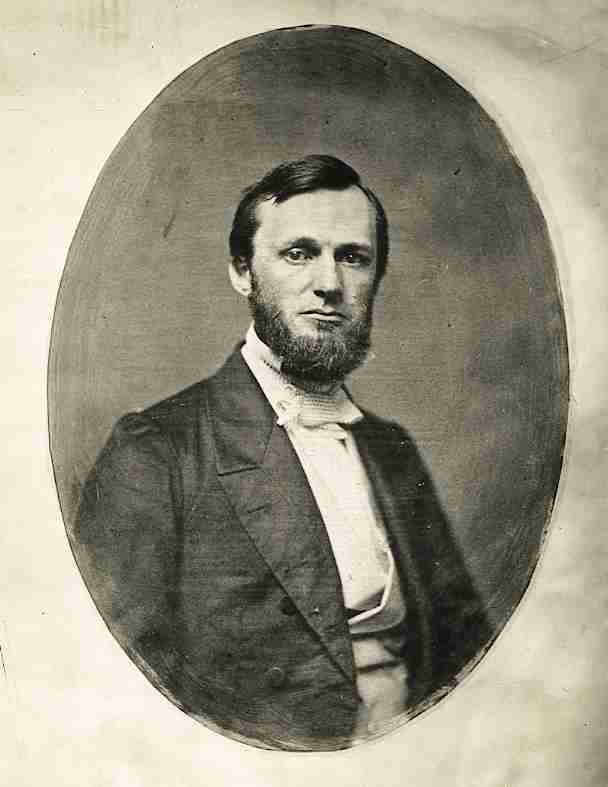 Then, in 1850, he was elected Assistant Secretary of the Smithsonian Institution to its first Secretary Joseph Henry. He filled two freight cars with his collections and shipped them to the Smithsonian. As Assistant Secretary, he encouraged any and all explorers and expeditions through prior training and prodigious letter-writing to bring back specimens for the Smithsonian. He also obtained funding from the government to build the United States National Museum to display the collections. In the next 37 years of his life, he published over 1000 papers and books including Mammals of America and the Birds of North America. He added hundreds of new species to every branch of natural science, for instance, he increased the known number of mammals by 25% as he classified the material shipped to him from all over the country. He started the United States Fish Commission in 1871 in response to enquiries about the decline of fish along the eastern coast of North America. Later he was named fish culturist of the world by the Germans and his research led to the eventual establishment of research facilities at Wood’s Hole, Massachusetts. Like Pennsylvania native Rachel Carson, who later studied at Wood’s Hole, Baird seemed to be fond of the ocean. In 1878, Joseph Henry died and Baird became the Second Secretary of the Smithsonian and retained the title of Fish Commissioner. But after nine years at the helm of the Smithsonian, he resigned and died two months later at Wood’s Hole. Like Baird, we finished our day by driving (instead of walking) up the winding, scenic highway along the eastern side of the Susquehanna River to Northumberland to visit the well-preserved home of the Rev. Dr. Joseph Priestley. In 1799 Priestley, a Unitarian minister from England credited with the discovery of oxygen, fled to America to escape prosecution for his theological and political views. There he isolated carbon monoxide in his Northumberland home before dying in 1804. No doubt, Baird had visited his grandson, also named Joseph, during his monumental walking tour. 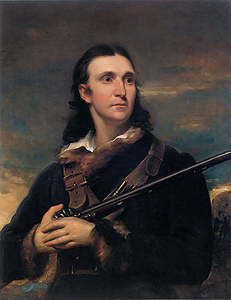 Although the homes of the Englishman Priestley and Frenchman Audubon, neither of whom lived very long in Pennsylvania, are well-preserved and open to the public, no such monument exists for Spencer Fullerton Baird in his home state. But every time I visit the Smithsonian, I am reminded of Spencer Fullerton Baird and his selfless life devoted to the discovery and study of North America’s natural heritage. For further information: Ned Smith Center for Nature and Art, 176 Water Company Rd. P.O. Box 33, Millersburg, PA 17061, (717) 692-3699 or e-mail nedsmith [at] epix [dot] net. 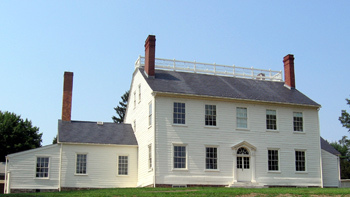 John James Audubon Center at Mill Grove, 1201 Pawlings Road, Audubon, PA 19403, (610) 666-5593. Joseph Priestley House, 472 Priestley Avenue, Northumberland, Pa 17857, (570) 473-9474. Their e-mail is mbashore [at] state [dot] pa [dot] us. All three places are open to the public and have special programs for adults and children.